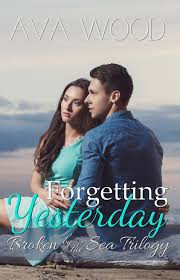 It has been a while since I read a young adult romance and Forgetting Yesterday has made me fall in love with this genre all over again. This book was the first in the Broken by the Sea Trilogy and it was so brilliant and captivating that I could not stand to put the book down. The characters were so realistic and easy to connect with because Ava brought their emotions alive with her flawless writing. There were parts in the book which brought tears in my eyes and others made me fall in love with Adam. Missy's character was well written and contained the depth and strength that was much needed to carry this book. However, I did wish that we could have seen some parts of the book through Adam's point of view because that would have enabled the reader to understand him better especially in the scenes where he talks about his problems with his father. The sweet romantic scenes between Adam and Missy made me feel all gooey on the inside and I just loved their simplicity so much. Ava Wood is a talented writer who is full potential, I am dying to read the next book in the series. Missy Shaw, a star school basketball player, has her entire life ripped away from her when her father decides to move them from their hometown Kansas to Florida after her mothers death. Now Missy has to adjust to a new city and school and on her first day at she runs into the schools star basketball player, Adam Miller. Adam is a gorgeous and sweet boy who begins to show interest in Missy from her first day at school. As they spend time together during a school project, Missy hides her families hurtful secrets, from Adam. Will Adam be able to save Missy from her family and herself?